5 Getting and providing feedback from the node and tasks. 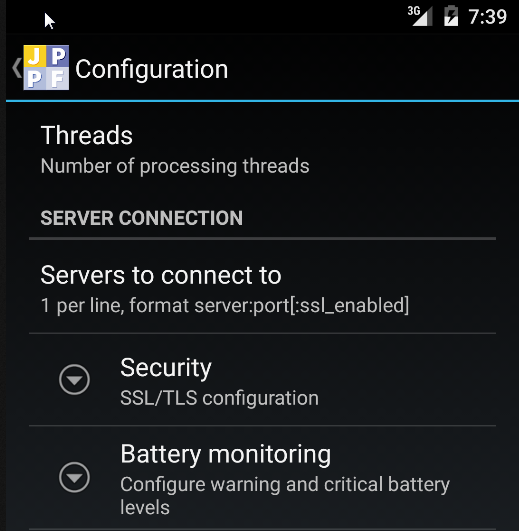 The JPPF Android node is a port of a standard JPPF node to the Android platform. It allows you to execute JPPF jobs and tasks on any Android device running Android Kitkat (version 4.4 - API level 19) or later. It functions as an offline node (see Offline nodes), which means it will only connect to the server to fetch new work to perform or return the result of tasks execution. It will not be connected while executing tasks. download the Android node APK from the JPPF downloads page onto your device. This is equivalent to setting the configuration property "jppf.processing.threads" in a standard JPPF node. The ":secure" part is optional and when not specified, it will default to "true". It determines whether to use SSL/TLS-secure communication with the server, in which case you will also need to specifiy the security settings. This setting corresponds to defining a node connection strategy (see Node connection strategy). a) when "Mutual authentication" is enabled, you also need to specify a key store and associated password, holding a public/private key pair for the node. The server will also need a trust store holding the node's certificate. When this setting is enbaled, the corresponding settings "Node key store location" and "Node key store password" will also be enabled, and when disabled the node ley store settings will be disabled as well. the "Browse/Search" button which will lead to a screen allowing to browse accessible files, such as those in "Downloads", "Recent files", or the JPPF node app storage. remember that Android only recognizes key stores in Bouncy Castle format (usually files with a ".bks" extension) and does not accept the Java JKS format, so you may need to convert your existing key or trust stores if you created them with the JDK's "keytool" utility. 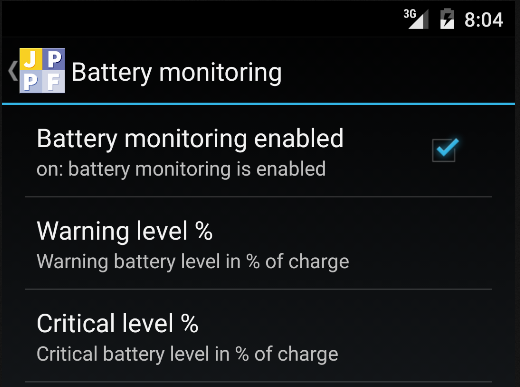 when the warning level is reached, the node, will finish the current job, if any, then stop taking any job and wait until either the battery level rises back above warning, in which case it will resume it normal activities, or the critical level is reached. Important: the only artifacts that Android will load dynamically are either dex-ed jar files or APK files. Nothing else will work. Thus, only these types of files should be added to the job's classpath. In this section, we will discuss ways to package the code of the JPPF tasks so they can be executed by an Android node. From now on we will assume that the biuld tools directory is in the system path and refer top the dex tool as "dx". This is what is done in the related Android demo from the JPPF samples pack. While simply using the dex tool may be convenient and sufficient, for packaging tasks classes that do not use any android-specific APIs or libraries, you will need a different way of building when using Android-only features in the code of the tasks. As seen previously, the JPPF node provides by default a basic view with simple visual feedback such as connection and execution status, current job and number of tasks. You can, instead, specify your own custom feedback handler and view, to process and display data relevant to your jobs. Note that the setUIComponent() and getActivity() methods should not be overriden, which is why they are declared as final. Also note that a default implementation of handleError() is provided, which prints the error to the Android logcat log manager at verbose level. Finally, the implementation class must have a no-arg constructor, to enable its instantiation via reflection. 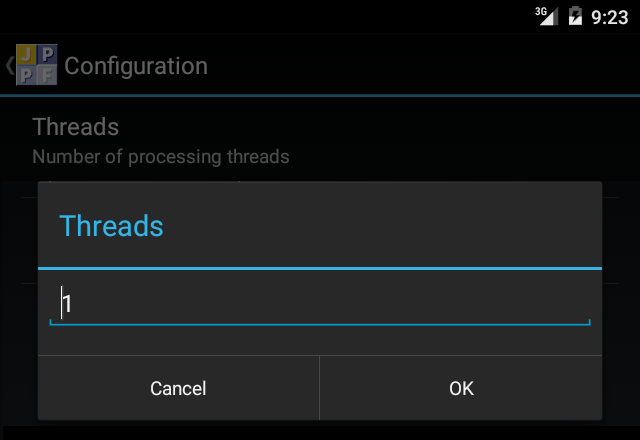 We can see that AndroidNodeIntegerationAdapter extends the more general class NodeIntegerationAdapter<Activity>, which provides an empty implementation of the methods in the TaskExecutionListener interface (see the Extending and Customizing JPPF > Receiving notifications from the tasks section of this manual). It also extends the class NodeLifeCycleListenerAdapter (see Extending and Customizing JPPF > Receiving node life cycle events), which provides an empty implementation of all the methods in the NodeLifeCycleListener interface. Just as for the tasks to execute, the feedback handler implementation is not known initially to the Android node. It must therefore be loaded dynamically and transported with each job for which feedback processing is desired. For this, the first step is to package the feedback handler as an Android application package (APK). Please note that, at the time being, only Java code and resources will be used from the resulting APK. In pariticular, this means that no Android resource, such as layouts, values or drawables will be accessible. Thus, any such resource, including the feedback handler's view, must be instantiated and accessed programmatically, using the corresponding objects that represent them. Another way to express it is that the "R" class for the loaded APK will not work. For the feedback handler implementation to be used, it must be transported along with each job for which feedback processing is required. This is done in exactly the same way as described in section Creating and submitting jobs. As already mentioned in this manual, the JPPF Android node relies on the ability to dynamically load arbitrary code to execute on a device. This is done with the DexClassLoader API and provides JPPF with the ability to execute tasks on Android devices without having to rebuild the node from the source code each time the code of the tasks changes. Although the dynamic code loading constitutes the most important feature of the JPPF Android node, it may be perceived as a security risk. If this is the case from your or your organization's point of view, or if there is the least doubt about security, then we recommend that you do NOT install or use the JPPF Android node. The first permission allows the node to connect to a JPPF server, while the other two provide read access to document sources that are used to find and locate the trust and key stores when SSL communications are enabled. Since the code of the tasks and optional feedback handler is dynamically loaded, any additional permission they require will not be dynamically granted, since the Android permissions framework only grants static permissions declared in the manifest of an app. Due to this, you will need to edit the JPPF Android node's manifest and rebuild it from the source code to grant additional permissions. For this, please refer to the dedicated section Building from the source code in this guide. 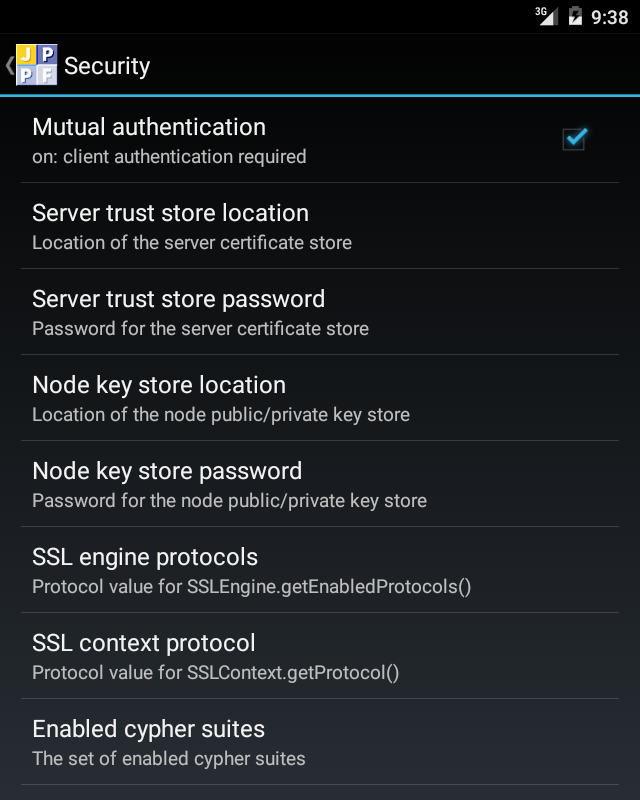 Securing the node-to-server communications with SSL is the safest way to use the JPPF Android node. Enabling SSL is done via the node settings, by specifying secure server connections and configuring the related SSL parameters. JPPF also allows using non-secure connections, to enable easy testing during the development cycle. We would like to emphasize, however, that this is not recommended for production or security-minded environments. Using unsecured connections may open the door to jobs and tasks of unknown origin being executed on the device, with unpredictable consequences. 1) Server configuration: a JPPF server can handle both secure and non-secure connections at the same time. You will probably want to disable unsecure connections (see Configuring SSL/TLS communications > Enabling secure connectivity > In the servers). The source for the JPPF Android node is available as a separate download: JPPF-x.y.z-node-android-src.zip. To install it, simply unzip the file. You can then either import it in Android Studio (from the menu File > New > Import project) or use it as a Gradle project. 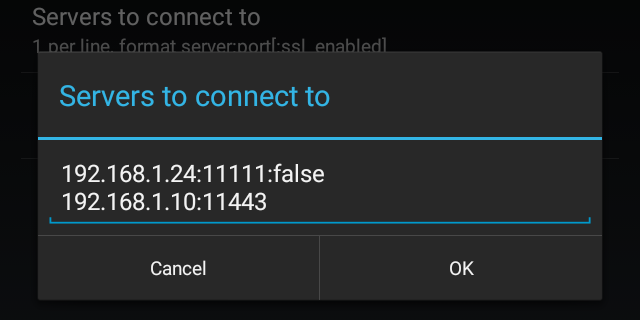 'app': this is the JPPF Android node app, built as an APK that can be installed on a device. The Android manifest is located at app/src/main/AndroidManifest.xml, this is where you can specify addtional permissions if needed. 'demo' : this is a an example of a [#Getting and providing feedback from the node and tasks.|feedback handler] implementation, built as an APK and intended for dynamic loading and transport along with a job's data. It depends on the Mandelbrot fractals demo found in the JPPF samples pack, and draws each Mandelbrot image as it is being computed by the node. If you have imported the project in Android Studio, then the build is generally automated or performed from the user interface. Therefore, we will now focus on building from the comand line with Gradle.